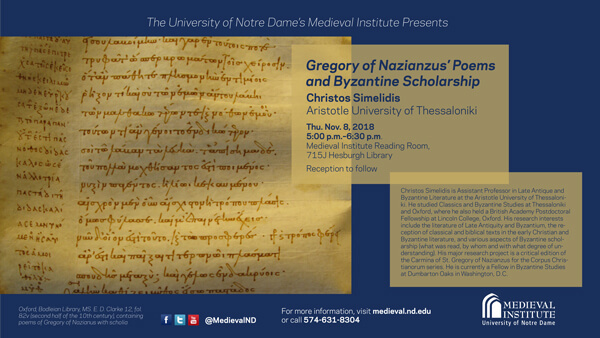 Lecture (Byzantine Series): "Gregory of Nazianzus’ Poems and Byzantine Scholarship"
Gregory of Nazianzus (ca. CE 330-390), an important theologian of the early Christian Church and the most widely read and imitated patristic author in Byzantium, produced a great amount of poetry in traditional classical language and metres. This talk will present various aspects of his poems’ transmission and reception history. An intriguing question that arises is whether these poems won a place in the school curriculum. The scholia and the paraphrases transmitted with the text of the poems in many manuscripts, together with others found in lexica, florilegia and schedographies (educational exercises), suggest that selections of these poems were used in schools. Gregory’s classicizing literary output (and especially his poems) mattered a great deal in shaping the educated Byzantine’s attitude towards the Classics throughout the life of Byzantium and thus ensuring the survival of antique Greek literature. Christos Simelidis is Assistant Professor in Late Antique and Byzantine Literature at the Aristotle University of Thessaloniki. He studied Classics and Byzantine Studies at Thessaloniki and Oxford, where he also held a British Academy Postdoctoral Fellowship at Lincoln College, Oxford. His research interests include the literature of Late Antiquity and Byzantium, the reception of classical and biblical texts in the early Christian and Byzantine literature, and various aspects of Byzantine scholarship (what was read, by whom and with what degree of understanding). His major research project is a critical edition of the Carmina of St. Gregory of Nazianzus for the Corpus Christianorum series. He is currently a Fellow in Byzantine Studies at Dumbarton Oaks in Washington, D.C.